Excerpted from Wikipedia, the free encyclopaedia. Sardinia (Sardigna, Sardinna or Sardinnia in the Sardinian language, Sardegna in Italian, Sardenya in Catalan), is the second largest island in the Mediterranean Sea, between Italy, France and Tunisia, south of Corsica. 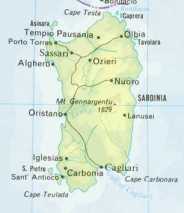 Sardinia has an area of 24,090 km2 and a population of 1.65 million. It was called "Ichnusa" by the Phoenicians and "Sandalyon" by the Greeks because of its shape, recalling a footprint. Sardinia is an autonomous region of Italy. The regional capital is Cagliari. The region is divided into four provinces: Cagliari, Sassari, Nuoro and Oristano; another four provinces have been proposed: Olbia-Tempio, Ogliastra, Carbonia-Iglesias and Medio Campidano), to enter effect in 2005. The island contains numerous extraordinary tourist areas, including the Costa Smeralda and Gennargentu. Mostly famous for its beaches, its land is rich in other interesting places. The climate is mainly Mediterranean, with a warm spring and fall, hot summer, and mild winter. Sardinia is suffering from a multi-year drought, thought by some to be due to global warming. The language of Sardinia is Sardinian, a Romance language with obscure origins in Phoenician, Etruscan, and Near Eastern roots. While it has been significantly supplanted by Italian for official purposes, and it is completely unknown among some sections of Sardinian youth, specially in Cagliari, Sardinian is still the main national language (Sardinians identify themselves as a people and as a nation) in fact. In the northern regions of Gallura and Sassari, the dialect spoken is not Sardinian but a variety of Corsican (as in Corsica), an Italian dialect. In the island of San Pietro, the dialect spoken is Ligurian, from Genoa. In the city of Alghero, a mediaeval dialect of Catalan is still spoken (the name of the city in Catalan is L'Alguer) as the city was a Catalan colony in the past. Sardinia's currency (as a part of Italy) is now the Euro, but Sardinians still unofficially refer to su Francu (or loc. "su Pidzu"); 1 francu=1,000 former Italian Lira. Several gold and silver mines operate on the island. The Sardinian economy is today focused on tourism, industry, commerce, services and information technology; an increasing income is coming from its famous wines and gastronomy. Trains on Sardinia connect the whole island but are rather slow. Some run on narrow gauge track. Sardinia is a precious natural resource, having protected thousands of rare animal and plant species. Sardinia's history is very ancient. In 1979 human remains were found that were dated to 150,000 BC. In Prehistory Sardinia's inhabitants developed a trade in obsidian, a stone used for the production of the first rough tools, and this activity brought Sardinians into contact with most of the Mediterranean peoples. In the age from Neolithic times to the Roman Empire, the Nuragic civilisation took shape on the island. Still today, more than 7,000 Nuraghe survive. It is speculated that the mysterious Shardana people landed in Sardinia coming from the eastern Mediterranean Sea, in about the 20th century BC. Very little is known about this people, whose name (which probably means the People of the Sea) has been found in some Egyptian inscriptions, and most hypotheses are developed following some linguistic studies; according to these, the town of Sardis (Lydia) would have been their starting point from which they would have reached the Tyrrhenian Sea, dividing into what were to become the Sardinians and the Etruscans. However most theories regarding the original population of Sardinia have been formulated prior to genetics research and in the traditional frame of east-west movements. Genetics has now shown that Sardinians are a pre-Indo-European population different from all surrounding and much younger groups. The density, extensiveness and mere size of the architectural remains from the Neolithic, pointing to a considerable population of the island, together with recent theories about the location of the Hercules Columns, reverse the question into where Sardinians did land, or where the Shardana settled besides the known Egyptian destination. Beginning around 1000 BC, Phoenician mariners established several ports on the Sardinian coast. In 509 BC, war broke out between the native Nuragic people and the Phoenician settlers. The settlers called for help from Carthage, and the island became a province in the Carthaginian empire. In 238 BC, after being defeated by the Roman Republic during the First Punic War, Carthage ceded Sardinia to Rome. From 456 - 534, Sardinia was a part of the short-lived kingdom of the Vandals in North Africa, until reconquered by the Byzantine emperor Justinian. Under the Byzantines, the imperial representative was a judge who governed from the southern city of Caralis. Byzantine rule was practically non-existent in the mountainous Barbagia region in the eastern part of the island, and an independent heathen kingdom persisted there from the sixth through ninth centuries. Beginning in the eighth century, Arabs and Berbers began raiding Sardinia. Especially after the fall of Sicily in 832, the Byzantines were unable to effectively defend their most distant province, and the provincial judge assumed independent authority. To provide for local defense, he divided the island into four Giudicati, Gallura, Logudoro, Arborea, and Caralis. By 900, these districts had become four independent constitutional monarchies. At various times, these fell under the sway of Genoa and Pisa. In 1323, the Kingdom of Aragon began a campaign to conquer Sardinia; the giudicato of Arborea successfully resisted this and for a time came to control nearly the entire island, but its last ruler Eleonora di Arborea, was eventually defeated by the Aragonese in the decisive Battle of Sanluri, June 30, 1409. The native population of the city of Alghero (S'Alighera in Sardinian, L'Alguer in Catalan) was expelled and the city repopulated by the Catalan invaders, whose descendants speak Catalan to this day. Sardinian language: Sardo logudorese, Sardo campidanese, Gallurese, Sassarese.